Developer: Sterling Equities & Hines Interests for Bear Stearns & Co., Inc. This huge office building is distinguished by its very large, octagonal glass crown, which is illuminated at night. Its seven-story beacon is enormous and makes this building New York City's lighthouse, albeit with a stationary rather than a revolving light. Although the Empire State Building has long had its pinnacle illuminated and the Chrysler Building not too long ago turned on its zig-zag lights a few years ago for the first time in decades, New York City has generally lagged far behind Dallas, where many buildings have had interesting night-time illumination. Whereas the Chrysler's illumination is jazzy and delicate and the Empire State Building's employs different colors for different occasions, this beacon is not dainty and is very bright. It is one thing to illuminate wonderful architectural detailing such as at the Crown Building (see The City Review article) on the southwest corner of Fifth Avenue and 57th Street or the World Wide Plaza (see The City Review article) on Eighth Avenue at 50th Street, but quite another just to be giant uncovered light bulb. This, of course, is not an uncovered light bulb and in fact the glass-like panels of the crown are quite attractive during the day but at night the analogy is not too far from the truth. The Metropolitan Life Insurance Building at 1 Madison Avenue has long had a bright "lantern" at its top, the 1 International Plaza Building (see The City Review article) also has a handsome illuminated top that rises in tiers like a Sumerian helmet, and the fine Paramount Building on Seventh Avenue at 43rd street has restored its illuminated globe at its top and all of these are handsome and discrete and much, much smaller than this building's beacon. New beacons are welcome, of course, as are illuminations of handsome buildings and the terrorist attacks of September 11, 2001 (see The City Review article) and the subsequent temporary twin beams of light that recreated "ghosts" of the demolished twin towers of the World Trade Center in Lower Manhattan have certainly created a greater public awareness and sensitivity for night-time architecture. So, this building deserves credit for providing such a grandiose skyline beacon and one must concede that its size is in scale with the structure's very large silhouette. Like the former A. T. & T. Building that is now known as Sony Plaza (see The City Review article) at 540 Madison Avenue between 55th and 56th Streets, this building is inordinately large for its relatively modest number of stories. While the A. T. & T./Sony tower generated great controversy over its Post-Modern design by Philip Johnson and John Burgee and over the subsequent enclosing of its public street-level spaces to provide retail spaces for Sony, this building's site is no stranger to controversy. For decades, it was occupied by a handsome but small, limestone-clad office building that housed the oval penthouse offices of William Zeckendorf, the famed developer. It was subsequently acquired by Ware Travelstead, a developer who erected the handsome green-glass towers nearby at Park Avenue Plaza behind the Racquet Club on Park Avenue and Tower 59 on the mid-block across 49th Street from Saks Fifth Avenue. Mr. Travelstead commissioned Kohn Pedersen Fox to design a very tall office tower with slanted facades above its base and topped with a very elegant and delicate crown of screens. The proposed building would have been about as tall as the Chrysler Building but no where near as slender because it planned using a lot of unused "air rights" from Grand Central Terminal. 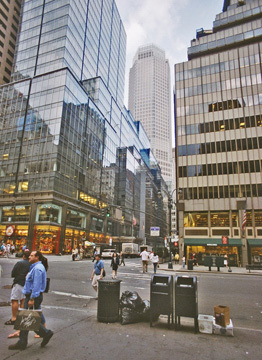 The city, however, opposed the plan and enacted a special air-rights-transfer district that limited the use of such unused air-rights on eligible receiving sites and was successful in defeating legal challenges from Mr. Travelstead, whose proposed tower would have to be scaled down dramatically. Mr. Travelstead eventually abandoned his project and Bear Stearns & Co., which had been located at 277 Park Avenue, commissioning Sterling Equities and Hines Interest to develop this new tower designed by Skidmore, Owings & Merrill. S.O.M., under the leadership for many years of Gordon Bunshaft, was famous for its clean-cut, crisp and very elegant corporate projects such as Lever House on Park Avenue (see The City Review article), the former Manufacturers Hanover Bank Building (see The City Review article) on the southeast corner of Fifth Avenue and 43rd Street and the imposing and very attractive former Union Carbide Building (see The City Review article) directly across 48th Street from this building. In recent years, however, the architectural firm has changed its style and under David Childs's leadership has developed much more of a Post-Modern style, best exemplified by the World Wide Plaza and some of its designs for Columbus Center on the site of the former New York Coliseum at Columbus Circle. The S.O.M. design for 383 Madison is fairly conservative and one could argue that its "pin-stripe" façade patterning is appropriate for an investment banking firm such as Bear Stearns and also a welcome relief from the glass-recladdings of numerous masonry buildings on Madison Avenue near Grand Central Terminal (see The City Review article). In the 1970's, I unsuccessfully proposed to the city's Landmarks Preservation Commission the creation of a Grand Central Terminal masonry office building district. The beginning of the transformation of this district began with Donald Trump's recladding of the former Commodore Hotel just to the east of the terminal with mirror glass for the Hyatt Company. The Commodore was one of several hotels, such as the Biltmore and the Roosevelt that were developed to be architecturally compatible with the "Terminal City" concept of Warren & Wetmore, the co-architects of the terminal and also of the great Helmsley Building (see The City Review article), formerly the New York Central Building, that straddles Park Avenue at 46th Street. Many preservationists in the city were so angry with the Brutalist design of the Pan Am Building, now known as the MetLife Building (see The City Review article) by Walter Gropius and subsequent plans by Marcel Breuer to erect another major tower directly over the terminal that they campaigned vigorously and successfully to legally prevent any new development over the term despite the fact that Warren & Wetmore originally envisioned a pretty massive tower of about 30 stories over the terminal. The legal battle, which eventually went to the U. S. Supreme Court, was one of the most controversial preservation issues of the 20th Century. The Supreme Court held that the city was within its rights to reject the specific proposal before it at the time, but it did not rule out the eventual development of the air rights, a fact that the preservationists tried to obscure. The new Bear Stearns Building occupies the full block bounded by Madison and Vanderbilt Avenues and 47th and 48th Streets and rises 45 stories from an 8-story, square base in octagonal setbacks. While most office floors in modern commercial buildings are about 12 feet high, this tower rises 773 feet reflecting the presence of several tall "trading floors" and its seven-story "beacon." Bear Stearns has about 1,400 traders working on four trading floors in the base and can add 1,000 more traders on three more trading floors in the base. The shift from the rectilinear base to the octagonal tower affords the tenants more city vistas and it also relates somewhat to the angled facades of the nearby MetLife building. 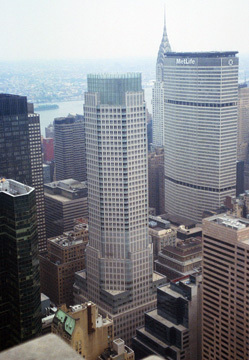 It should also be noted that two other major towers, 101 Park Avenue (see The City Review article), and 3 Park Avenue, are also angled on its site so the east midtown/Grand Central Terminal district actually is the city's home to such deviations from the city's traditional rectilinear grid pattern of development. "New Yorkers will have to put up with the wounded design for a long time. This is a building you wouldn't want to get anywhere near at a cocktail party. Dressed nearly head to toe in dour granite, and geometrically proper, it's stiff to the point of pass-out boredom. That something went wrong at 383 Madison should concern New Yorkers because the politically astute SOM has emerged as the most visible architectural firm in the dialogues about rebuilding at ground zero. Building is a very complex process, and the blame for the 45-story yawn can't be laid only at the drafting table: it has to be shared with the boardroom." At 773-feet-high, the building is a very, very big yawn, but one should not view such tall structures with boredom for they are much too visible. This building is now the dominant building on Madison Avenue and because of its beacon, which was not yet turned on when Mr. Giovannini wrote his review, it cannot easily be ignored. Described its facades as "fussily gridded," Mr. Giovannini adds that "Whatever dynamism inheres in the telescoping volumes and mitered corners is lost to the pattern." "As if revealing the subconscious desire of what the tower really wanted to be, a tiara of translucent glass emerges at the top," he wrote. The notion of a tiara is lovely, but given the girth of this one, it is more like a choker. Cresting a skyscraper in such a fashion is by no means a bad idea. Indeed, one could imagine this treatment installed behind the great "electric" parapet top of 570 Lexington Avenue (see The City Review article) to great effect. Certainly abstract beacons are better than corporate initials atop buildings and while Madison Avenue was once synonymous with the advertising industry, one can be thankful that the "tiara" is not broadcasting "Bear Stearns" and that immense signage is more appropriate to the new glitter of Times Square. If this 1.2-million-square-foot, masonry tower is not as shiny and sleek as some of the new Times Square monoliths, it is classy and its granite facades would have been quite welcome along the western edge of Rockefeller Center. This imposing building is built over the MTA/Metro North commuter railroad tracks and employs special cross-bracing to accommodate its large lobby and trading floors. The corporate move of Bear Stearns from Park Avenue to Madison Avenue is good for Madison Avenue and while the building is sedate its beacon will help reinforce the East Side from the dazzle of the West Side's Times Square district. While the new tower is not as exciting as Travelstead's Kohn Pedersen Fox design would have been, it is a bulwark for the Grand Central district and despite some quibbles there is no denying that it is impressive. Not all buildings need to be showstoppers and certainly this one is too large to be considered a "background" building and the context here is too mixed to offer guidelines. While this is a very high-tech building internally, it is not on its exterior, aside from its flamboyant beacon. At a time when the city is finally beginning to get some decent new architecture, this does not represent a breakthrough, but its form is attractive, distinctive and substantial. Conceivably by introducing more setbacks to provide smaller floors at the top this building could even have been taller, although its height has already surprised, if not "shocked," some observers. As it is, its proportions are awesome. Mr. Giovannini's disappointment with the building is not unjustified. New York City should be in the forefront of architecture and it still is not and Mr. Giovannini is properly concerned about what will happen at "Ground Zero," but that, as the bartender in "Irma La Douce," says "is another story."